Welcome to our new F-PROT Antivirus web shop! We have made some changes and improved the purchasing process. We hope you like some of our new features like automatic renewal and paying with PayPal. Below you can read more about our product selection and buy a license. If you are renewing F-PROT Antivirus for Solaris og BSD, please contact sales for further information, f-prot@CYREN.com. F-PROT Antivirus is the perfect antivirus solution for home users, providing state-of-the art protection without affecting productivity. F-PROT Antivirus is renowned for its ease of use and reliability. F-PROT Antivirus is fast but light on resources. A subscription to F-PROT Antivirus includes all updates, upgrades as well as personal support. The one-year subscription to F-PROT Antivirus is valid for up to 5 computers in one home for only $29. F-PROT Antivirus for Windows combines excellent detection, ease-of-use and flexibility into one lightweight and affordable antivirus package. F-PROT Antivirus provides you with comprehensive protection without affecting productivity. Signature-based malware detection together with advanced heuristics provides outstanding antivirus protection and automatic updates ensures low maintenance. Choose F-PROT Antivirus to protect your data against the ever increasing threat of malware. F-PROT Antivirus for Linux Workstations is fast, efficient and easy to use. It protects Linux workstations from the ever increasing threats of viruses, worms and other malware by detecting and disinfecting or deleting malicious programs. Unknown threats are detected with F-PROT's heuristic technology, thus providing the strongest defense available and being the perfect solution for your laptops and desktops. Stopping malware at the mail server level is an effective way of preventing malware from infecting your network. F-PROT Antivirus for Linux Mail Server is built on the same world-leading technology as other F-PROT products, providing excellent protection without affecting productivity. F-PROT Antivirus is easy to install and manage with low resource consumption and small memory footprint. Together with excellent customer service and personal tech support, F-PROT Antivirus is an affordable yet outstanding antivirus solution for your company. Protecting your network from the ever increasing threat of malware, is essential. 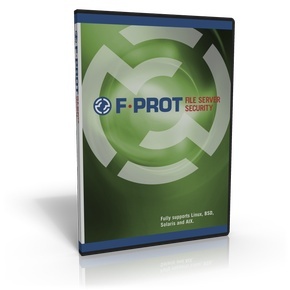 F-PROT Antivirus for Linux File Server is built on the same world-leading technology as other F-PROT products, providing excellent protection without affecting productivity. F-PROT Antivirus is easy to install and manage with low resource consumption and small memory footprint. Together with excellent customer service and personal tech support, F-PROT Antivirus is an affordable yet outstanding antivirus solution for your company.